It took homo sapiens hundreds of thousands of years on the planet to understand a fundamental, simple-sounding, question: how old is the Earth? The answer to this question has gone down in the history books as one of the most important geophysical and astrophysical discoveries of the past century. 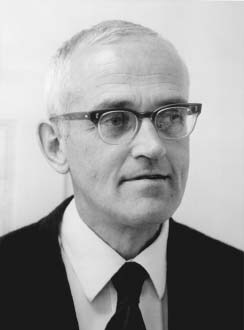 This paper, by Clair Patterson in 1956, is credited with providing the first accurate, measured age of the Earth. Patterson of course did not do science in a vacuum. His discovery was possible because of the work of many other researchers before him. The first work crucial to radioactive dating was done by some of the most famous names of physics: Marie and Pierre Curie discovered radioactivity of atoms, and in fact coined the name. Ernest Rutherford (of the gold foil experiment) first suggested the ratios of uranium and lead could be used to date rocks in 1905. Geologists began using this idea to try and measure the ages of old rocks, but at the time, didn’t know that there were different isotopes of each element, each with different decay rates. Their estimated ages using this method were all too large because of this problem. J.J. Thompson(you might know him for discovering the electron and for his plum pudding model) discovered isotopes of neon using a primitive precursor to a mass spectrometer. Further work on a mass spectrometer by F.W. Aston discovered 212 of the 287 naturally occurring isotopes, including lead. Geologists like Alfred Nier began measuring the isotopic ratios of old rocks, providing the basis for Patterson’s discoveries. Then World War II shook the world. World War II is a fabulous time period to study the relationship between history and science: scientific discoveries like atomic fission affected the course of history, while big projects like the Manhattan Project would change the very way science is done. * Patterson himself was drafted to work on the Manhattan Project; there, he helped develop the high precision mass spectrometers needed to measure abundances of tiny quantities of isotopes to very high precision. As it turns out, this technology is useful for more than just atomic weapons. Very briefly, to radiometrically date rocks with uranium and lead isotopic abundances, you need an unaltered sample of rocks (at least 2) of the same age. Within each rock, you measure the ratios of each set of lead isotopes (Pb207/Pb204 and Pb206/Pb204). Pb206 is produced by the decay of U238; Pb207 is produced by the decay of U235. We know exactly how fast this decay happens, and we know to high precision what the current U235/U238 ratio is. This information, all combined, allows us to calculate the age of the rocks. 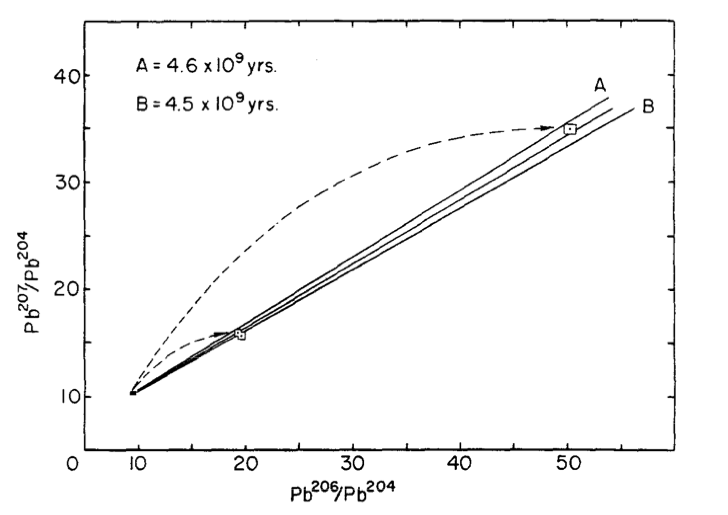 The plot shows the ratios of lead isotopes in meteorite samples, with 3 isochrones plotted as solid lines. The slope of the isochrone is used to calculate the age of the rock (here, 4.55 billion years is the best fit line in the middle). This view of Earth comes from NASA's Moderate Resolution Imaging Spectroradiometer aboard the Terra satellite. From http://www.geog.ucsb.edu/. This method allows us to calculate the ages of rocks formed at the same time. 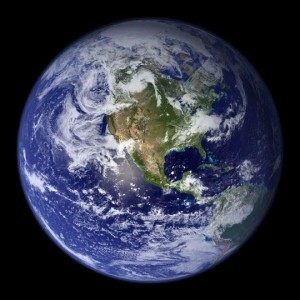 So why is the age of the Earth so tricky to calculate? One major problem is that the earth has plate tectonics—the rocks are constantly recycled through the Earth, giving them all different ages. The Moon has unaltered rocks—but Patterson made this measurement a decade before Moon samples were brought to Earth! Patterson’s trick was to measure the age of meteorites: convenient chunks of unaltered rock that make their way all by themselves to geologists on Earth. He postulated that meteorites and Earth all formed at the same time and out of the same materials. He took meteorites from five locations and tested his theory. His method worked! He measured the age of the Earth to be 4.55 billion years, with an error of 70 million years. Incredibly, today—after over 50 years of measurement advancements and sample returns from the Moon—that number is exactly the same, with a smaller error bar of 20 million years. Patterson spent the rest of his life working on lead from a completely different perspective: he was one of the driving forces to get lead out of gasoline, paint, food containers, and the water supply. So you can thank him for that too!